The Granny Square is one of the fundamental designs in crocheting. Since I got back into crocheting I've been staying away from them--working on scarves, broaches, belts, and various other projects. Way back when I made a few granny square blankets, but to my complete and utter frustration they weren't exactly what you'd call square. The shape they most resembled was a butterfly. Yeah, not exactly what one wants in a blanket. They are nice to cozy up with, but don't present themselves as well as they should. The biggest project (that I've completed) is a bed-sized afghan for my hubby. It turned out fairly nicely--but still had quite a bit of the butterfly effect. 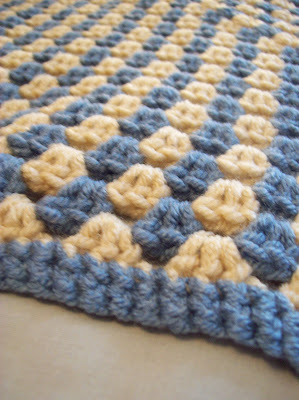 Well, now that I am back in the crocheting zone I decided to take a look at actual granny square patterns. In the past I was working from a pattern given to me at a 4-H craft camp day. Back then I was afraid of reading patterns so I worked primarily from oral instructions or pictures from library books. What struck me immediately was that I had been using more chains between shells and in corners than any of the online patterns indicated. (You have to check out this page of patterns--it's almost overwhelming and not in English, but there are so many cool things that I want to try!) Maybe the extra chains were helping to cause my "butterfly" shape? With some of the yarn I picked up from Michael's I made this blue and cream afghan. It could work as a baby blanket or a lap afghan. I am pretty happy with how it turned out--it's a square! I did cut down the number of chains--corners only had two and between each shell only had one. It is a granny SQUARE! There is the slightest bit of "butterflying" but not much. This is a close-up of the center of the afghan. I do really like how the colors work together. For the edging I did two rows of single crochet all around. Check out these amazing places I like to party! It's very pretty. 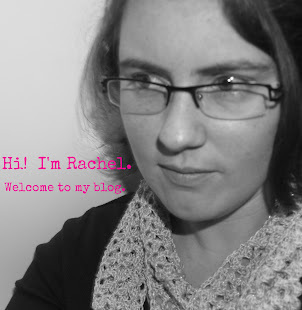 One of these days I'm going to learn to crochet. This is beautiful! Love the colors!! I'm with Rose, I wish you lived close and could teach me! Great detail, you are obviously pro. Lovely! These take a lot of work. The beginning goes so fast, but the bigger the round the longer it takes. The lasts rounds are torture, aren't they? But well worth it!! That looks so cozy and I love the colors. It looks perfect for a little babies room! this is something i've always wanted to do. makes me wish i'd paid more attention when my gram was trying to teach me how. thanks for linking up to tip-toe thru tuesday! I think it turned out great! I love the colors. Thanks for sharing at Terrific Tuesdays. Thank you so much for being a part of the creative sharing at Rook No. 17! I hope we'll have the pleasure of your company and creativity at tomorrow's "A Little Birdie Told Me..."